Hybridizing is the making of seeds by crossing different cultivars. In nature the bees and other insects or even wind can accomplish this. Many growers, in the quest to develop new types of flowers or to perfect the bloom or the foliage have done the crossing of the plants themselves rather than leaving it to nature. To do this one only has to take the pollen form one plant or bloom and put it onto the pistil of another plant or bloom. The major requirement is that you need to cross-pollinate diploids with another diploid, or a tetraploid with another tetraploid. The pollen is from what is called the pollen parent. The plant receiving the pollen and that develops the seed pod is called the pod parent. After the bloom is pollinated, generally seeds develop in a pod, and then over the summer the pod ripens. The pod is harvested once it is ripe and the seeds are gathered and later planted. These seeds will become new plants, which have traits from both its pollen and pod parents. If when these new plants grow and bloom they show improvement over the parent plants and other plants in commerce, the hybridizer may decide to introduce and register the plant. If the plant has no redeeming qualities, it is frequently composted. There are 3 types of foliage habit in daylilies, Dormant (Dor), Evergreen (Ev), and Semi-Evergreen (Sev). This refers to the behavior of the daylily foliage or leaves in the winter. Dormant daylilies' leaves die back completely. In the spring they have a distinctive spear-like appearance to the new growth. Evergreen daylilies do not die back. They retain their leaves throughout the year and continue to grow new leaves all year long. In the north they die back due to the cold, but when growth begins in the spring it is gradual, and does not have the spear-like growth of the dormant plant. Semi-evergreen daylilies display a mixture of the dormant and evergreen foliage traits. Whether a plant is dormant, evergreen, or semi-evergreen doesn't necessarily refer to its' hardiness. This is a topic widely discussed, and opinions on this vary widely. When considering hardiness, it is most helpful to see what other gardeners in your area are growing. Some growers are beginning to include zone hardiness for individual cultivars, but even this is just a guideline. Modern daylilies can be seen blooming from early spring to late fall. This has been accomplished by breeding the plants with different or extended bloom seasons. They are classified as early early, early, midseason, late, or very late. Another way the plants can bloom longer is that some of them are re-bloomers. This means that they bloom for a period of time, then after a rest period they begin to bloom again. This is much more prevalent in the warmer climates, but even in the cooler northern gardens there can be significant re-bloom under the right conditions. There are 2 major categories, divisions or "ploidy" of daylilies. Diploid and Tetraploid make up the majority of daylily plants. Unless you are going to hybridize, the "ploidy" or number of chromosomes a plant has doesn't matter. Daylilies are diploid if they have 22 sets of chromosomes. Species plants are diploid, and they naturally reproduce from seed. Tetraploid daylilies have 44 sets of chromosomes. This doubling of the chromosomes was initially accomplished by chemically treating the diploid daylilies with a substance called Colchicine. Although a treated plant, which has become tetraploid, may later revert back to being diploid, generally the offspring of two tetraploid plants will forever remain a tetraploid. Tetraploid daylilies are frequently said to have heavier substance, larger flowers, and to be sturdier or stronger than diploids. This isn't always the case, and frequently it isn't possible to know whether a modern day plant is diploid or tetraploid by looking at it. The use of a microscope to measure the size of the pollen granules may be the only way to easily differentiate them. Lastly, there is also a very small category of daylily plants that are called Triploid, these have 33 sets of chromosomes but they are generally considered to be sterile. There are basically 2 types of hosta foliage, variegated and non-variegated. If variegated, it can be either edge or medially variegated. So if it is light in the center part of the leaves it is "medio" variegated and if it has a light area on the edge of the leaves, it is said to be "marginally" variegated. There are also some new "unusual" foliage looks that are being seen in today's marketplace and gardens. It is possible to see leaves which appear to be streaked, stippled, misted, and even puckered. In addition to all of this, hosta foliage can range in color from almost black, deep dark blue grey to green to pale yellow. Many hosta emerge in the spring as one color but actually develop into another darker or lighter color as the season progresses. Some hosta may have darker or red coloration on the stems or petioles which make them unique. With the range of possible colors and then the addition of variegation there are many combinations resulting in some very unique looking hosta. Although most gardeners don't think of hosta as a flowering plant, modern hosta can be seen blooming from early spring to late fall. 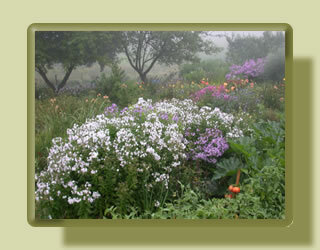 This has been accomplished by breeding the plants with different or extended bloom seasons. They are classified as early, midseason, and late. Most hosta flowers range from white to purple, with some of them being stripped in appearance. Generally speaking the hosta blooms have not been considered to be an attractive feature of the plant, and many growers routinely cut off the flower scapes as they begin to develop rather than have them visable in their gardens. This may change, as some hybridizers are working on developing blooms that are more attractive. Some now can be seen that grow uniformly around the scape rather than being all on one side, are doubled, or even spidery in appearance. Hosta (which were once only considered for their foliage contribution in the garden landscape), may soon be viewed equally for their attractive blooms. First, one common misconception needs to be clarified. Lilies are not related to daylilies. Lilies are bulbs that have large fleshy scales, but no outer protective layer, rather than being a fleshy root like daylilies. Some names or terms that you might see or hear in regard to lilies are: Species, Asiatic, Oriental, Martagon, Trumpet, Aerulian, LA Hybrid, Orienpet and Asiapets, among others. Lilies have blooms that can be upward facing, outward facing, or downward facing. They can be many different colors and many are fragrant. Blooms can range from just an inch or two to many inches. In addition to those variations, lilies can also range in height from just a few inches to several feet tall!